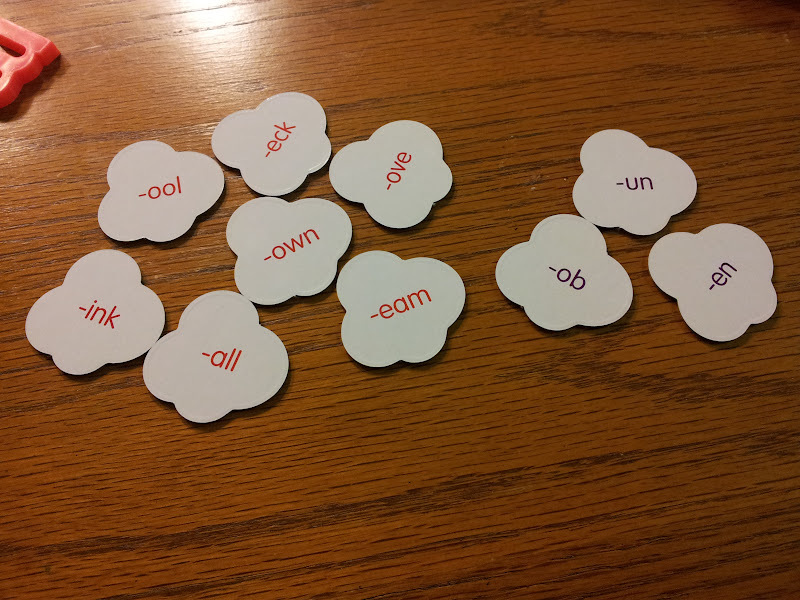 I just tried out the word game Pop for Word Families by Learning Resources and it was lots of fun! I used it with the little boy I have been tutoring this summer. There are several ways to play the game. 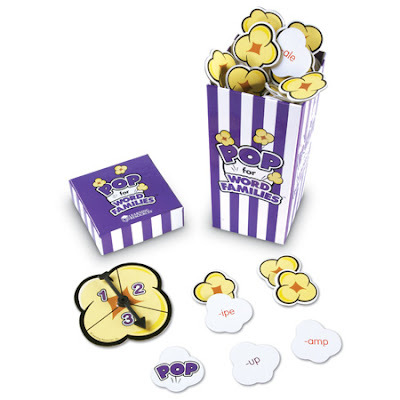 We played where you spin the spinner, take that many pieces of popcorn from the tub, and make a word for each piece of popcorn. For every word family ending you read correctly you get to keep the piece of popcorn. For example, if your piece of popcorn says "ake" then you might say "cake" or "rake. The person with the most pieces of popcorn at the end of the game wins! If you pull a "pop" then all of your pieces go back into the tub. The game comes with short and long word families so you can easily differentiate based on the students you have playing. It is a fun way to practice reading word families, making words, and recognizing the difference between long and short vowels sounds. This game would make a great addition to literacy centers or the daily five word work rotation. After you play it repeatedly in whole group, you can move it into word work. If you want to add a recording sheet or writing component to it then have students record the words they read or see how many words they can make for each word family. The possibilities are endless!! 1) Check out their new products. Comment below and tell which one is your favorite. 2) Like Learning Resources on Facebook. 4) If you have a blog add Chalk Talk to your blog roll. You can also visit Learning Resources on Twitter, YouTube, and Pinterest. You can leave one comment for each requirement or a separate comment for each. Don't forget to leave your name and email address for me. The giveaway ends Friday, August 17th at midnight. Good luck!! I really like the talk bar. I think it would be really great to use with story sequence. Just added you to my blog roll! I like their Hots Dots products! I liked Learning Resources on Facebook. I like Lr=earning Resources on FB. I follow you blog, too! I'm adding you to my blogroll, too! I like Learning Resources on FB! Pop for Word Families is my favorite! I like Learning Resources on Facebook and I follow Chalktalk. I Think Hot Dots are great. But then again, most of their products are worthwhile. The ChalkTalk blog is my go to for help and keeping current. Good Job! I don't have a blog. I am a stalker. I like Pop for Addition and Subtraction. I like all the POP games- seems like they have a lot for all subject areas and different topics. I love games that the rules and routines are the same but the content changes- makes it fast and easy! I like Learning Resources on FB. I liked LR on FB. Looks like a fun game! I follow your blog. I love the gator grabber tweezers, so fun! I'm a first year kindergarten teacher, and haven't got any tweezers for my sensory bin yet! I like Learning Resources on Facebook. I love their new buzzers. I bought both sets. I like LR on Facebook and I follow your blog. I love their hot dot games. Chalk Talk is on my blog roll. I liked LR on Facebook. I follow your blog by email. I follow Learning resources on FB. My favorite new product is "POP for addition and subtraction". I like the Farmer's Market Sorting Set. It's super cute! I like the Pop for Word Families or Pop for Blends games. You are on my blog roll. I "like" Learning Resources on Facebook. I love learning resources products. My favorites are Pop for addition @ Subtraction and Multiplication Master Electronic Flash Card. I follow Learning Resources on Facebook. I think the Froggy Feeding Fun looks cute and fun! I follow Learning Resources on facebook! I already have you on my blog roll! I like the "Sentence Buildings." I follow u via email. I like LR on fb. 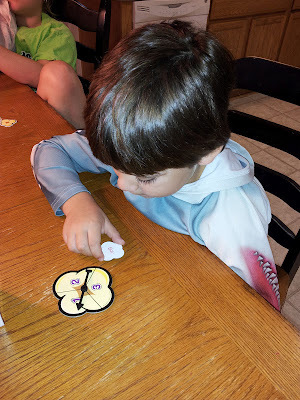 Froggy Feeding Fun is one of my favorites! I follow your blog! It is a favorite! I really like this giveaway! I just bought the magnetic hand pointers and LOVE them! I like Learning Resources on facebook! I like the letter construction kit and thw word family pop game. Either woule be wonderful in my reading intervention room. I follow your blog by e-mail. I liked Learning Resources on facebook! More Than Just "Sound it Out"